All NPC's, each with unique room content. 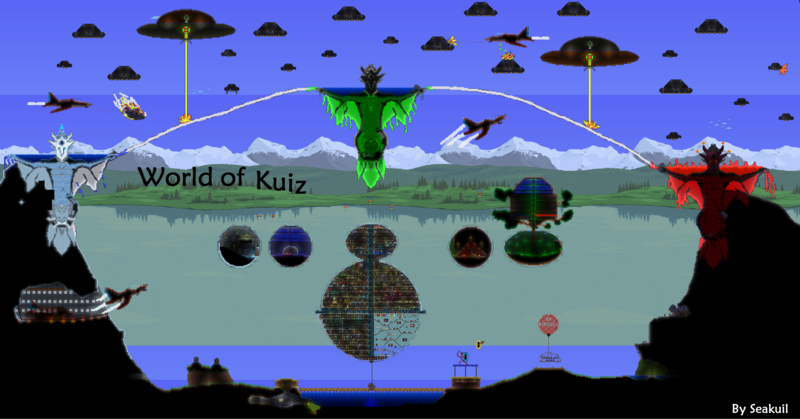 The Central Station and Kuiz Underground span the entire world for easy travel. The Trappery,' an obstacle course with loot at the end. Block Generators and plant farms. COMING SOON: The Incredible Rollercoaster! - Kraken ravaging the coastline. - Boss pixel art, explore the world to find them all. Nice map, love the coaster ride! Sorry for the month delay, and yep I've just uploaded it and I think the moderators are having a look.